The heavy-duty, pressure-resistant inner hose is protected by a flexible, puncture proof, stainless steel housing that makes it virtually indestructible. Ordinary hose fittings are easily crushed but the Bionic Steel Hose’s fittings remain solid no matter the pressure. Patented design and stainless-steel construction is lightweight, durable and kink-free. Compact design: Weight: 3.0 lbs, Length: 25 feet; slender hose circumference is lesser than standard rubber hoses. Flexible latex-lined lumen of internal hose encased in a sturdy stainless-steel outer layer allows for a consistent, steady and high-pressure water output. Tear-proof: High-grade metal outer layer is tear proof while maintaining a great degree of flexibility and rolls easy making storage convenient and hassle-free! View More In Gardening & Lawn Care. 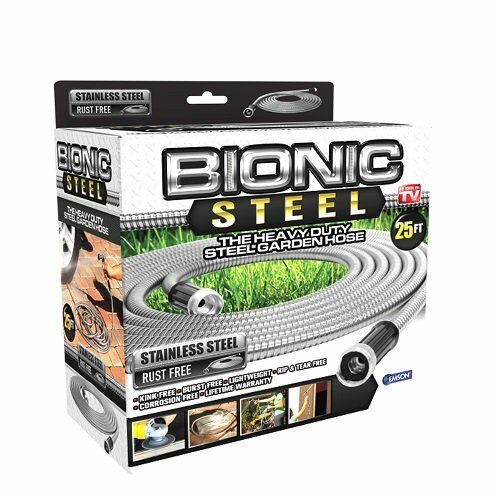 If you have any questions about this product by Bionic Steel, contact us by completing and submitting the form below. If you are looking for a specif part number, please include it with your message.